PRINCE2 Practitioner 2017 teaches you to fully integrate & apply the PRINCE2 method to the management of project scenarios. 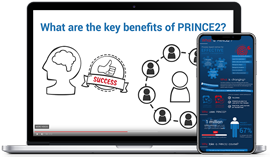 PRINCE2 2017 Foundation & Practitioner provides the comprehensive knowledge needed to successfully manage PRINCE2 projects. PRINCE2 Agile Foundation is suitable for anyone who wants to understand PRINCE2® governance and how it works with agile concepts. PRINCE2 Agile Practitioner teaches project management professionals to combine agile methods with the framework of PRINCE2® in their projects.